Need something easy and flavorful to throw on the grill this weekend? This Greek Marinated Chicken is it. The marinade for this chicken (similar to what I used for this Chicken Shawarma ) takes just a few minutes to stir together and creates an absolute explosion of flavor. It’s incredible. I only marinated my chicken in this magical mix for 30 minutes, but the flavor was still loud and clear. Once marinated, you can grill the chicken outdoors over a gas or charcoal flame, or (if you don’t have a grill) you can bake it in the oven. Either way, you’ll get a super flavorful and moist end product. 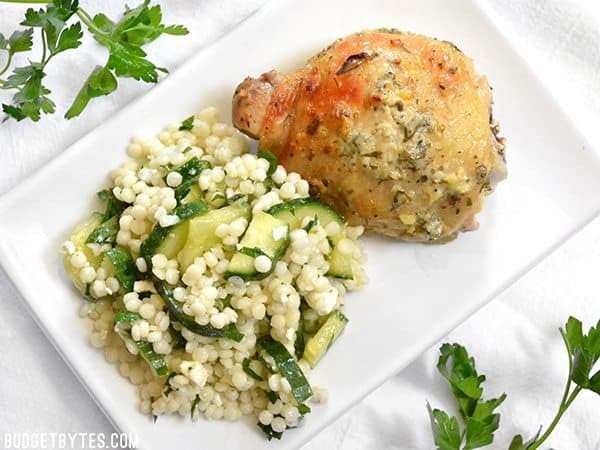 I served this Greek Marinated Chicken with my Lemony Cucumber and Couscous Salad, which was the perfect cold summer side, and incorporated both starches and vegetables into the meal. Two birds with one stone! 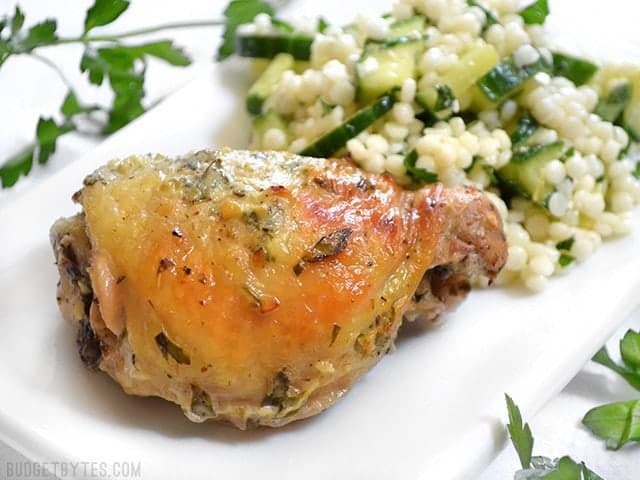 A tangy lemon and garlic marinade makes this Greek Marinated Chicken super fast and flavorful. Cook it in the oven or on a grill. To make the marinade, combine the yogurt, olive oil, minced garlic, oregano, salt, and some freshly cracked pepper in a bowl. Use a fine holed cheese grater or a zester to scrape the thin layer of yellow zest from the lemon skin into the bowl. Also add the juice from half of the lemon (about 1-2 Tbsp). Stir until the ingredients are well combined. Roughly chop a big handful, or about 1/4 bunch, of parsley and stir it into the marinade. 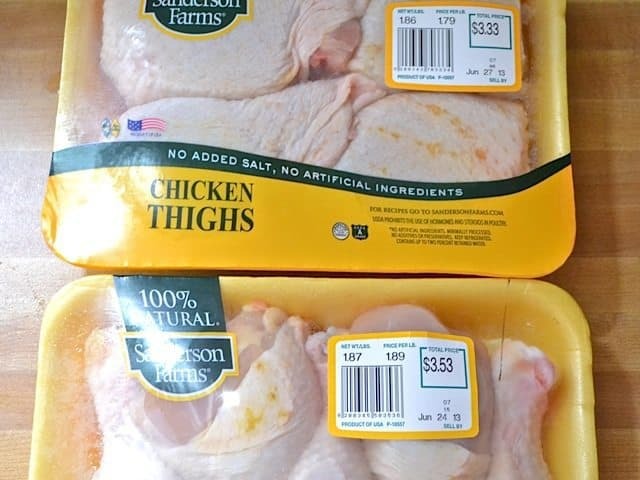 Add the chicken pieces and marinade to a gallon sized zip top bag. Remove as much air as possible, close the bag tightly, and massage the bag to mix the contents and make sure the chicken is well coated. Refrigerate the bag for 30 minutes. After marinating for 30 minutes, either cook the chicken on a grill OR preheat the oven to 375 degrees in preparation to bake the chicken. 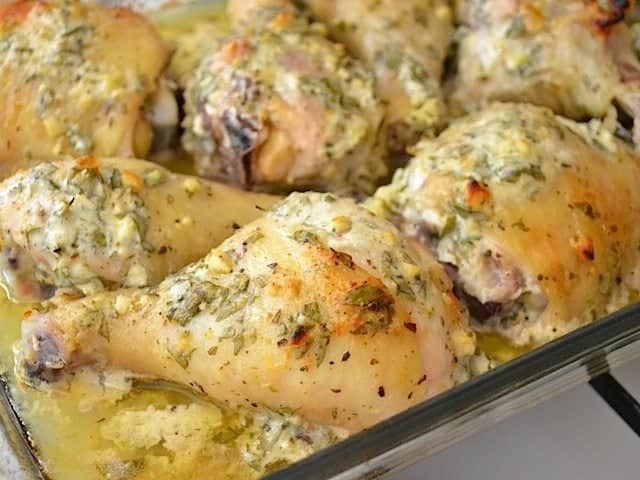 To bake the chicken, place the chicken pieces in a large casserole dish (9x13). 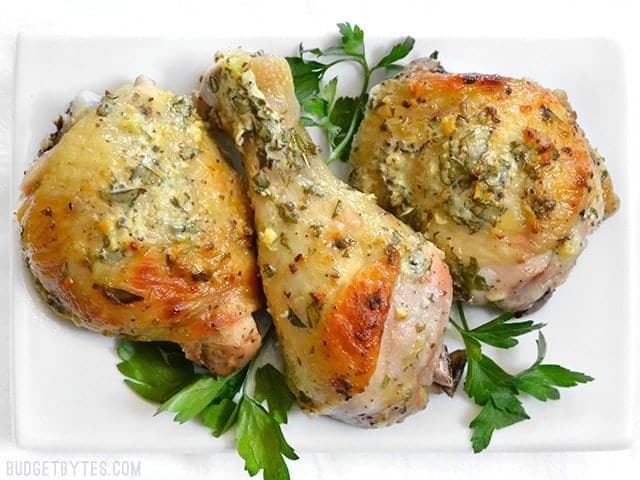 Bake the chicken in the preheated 375 degree oven for 45-60 minutes, or until golden brown on top. This recipe is extra garlicky. If you're not into heavy garlic, try starting with two cloves instead of four. First prepare the marinade. 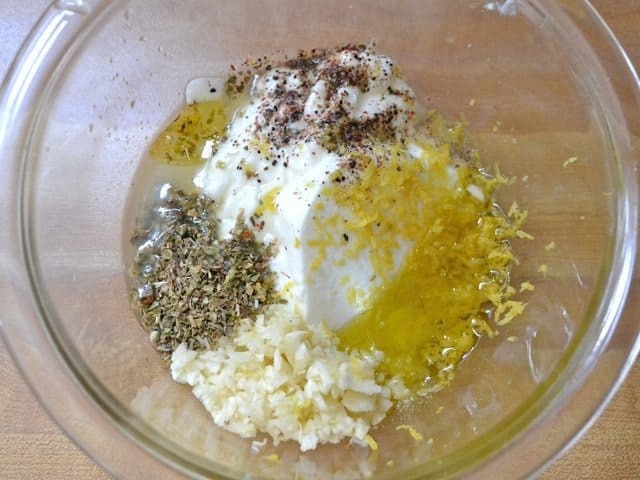 Combine the yogurt, olive oil, oregano, minced garlic, salt, and some freshly cracked pepper in a bowl. Add the zest from one lemon and the juice from about half of it (1-2 Tbsp). Stir these ingredients until well combined. Add a handful, or about 1/4 bunch, of roughly chopped parsley. This is your finished marinade (or a REALLY awesome dip!). I used about 3.75 pounds of chicken pieces (drumsticks and thighs). You could easily half this Greek Marinated Chicken recipe, if needed. Add the chicken pieces and the marinade to a large, gallon-sized zip top bag and mix it around to make sure the chicken is well coated. Refrigerate the bag for 30 minutes. After marinating, you can either grill the chicken or bake it. I don’t have an outdoor grill, so I decided to bake it. 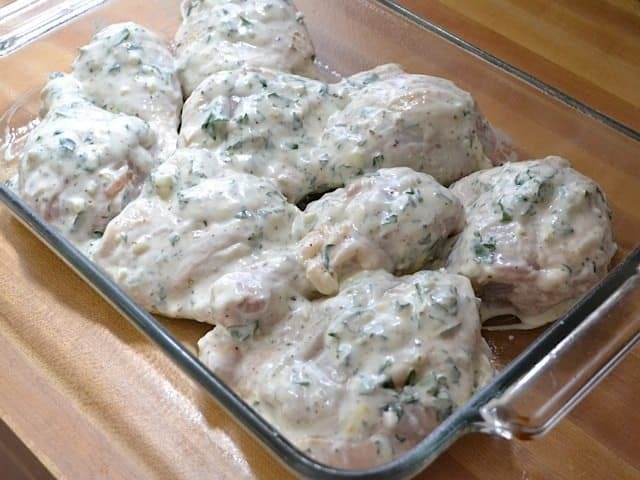 Place the chicken pieces in a large casserole dish. I ended up pouring the extra marinade over top, but later realized that this just made it take longer to brown, so I don’t suggest doing so. There is plenty of flavor in the marinade that you won’t need to add the extra. 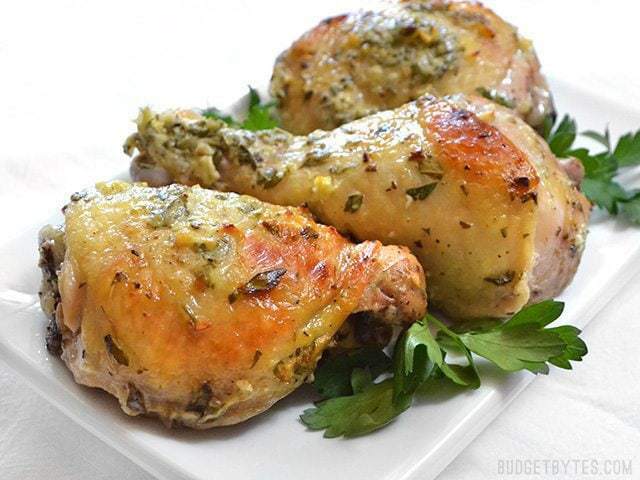 Bake the chicken in a preheated 375 degree oven for 45-60 minutes, or until it is golden brown. It will smell SO good! Now eat! This was really good. I’ll have to let it marinate a little longer next time to really soak up the flavors. But we really enjoyed it served with a cucumber salad, flatbread, and couscous. Thanks for another great recipe! Wow!! We loved this chicken. 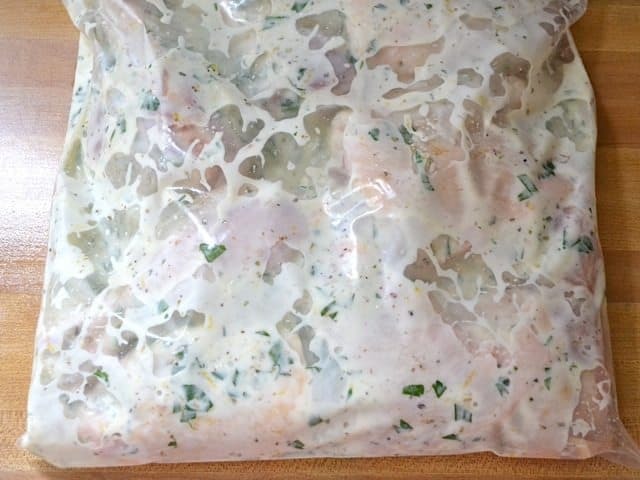 I never made a yogurt marinade before. I used bone in breasts and they were so moist and full of flavor. I’ll definitely make this again. Thanks for another great recipe!! Can I use Greek yogurt instead? 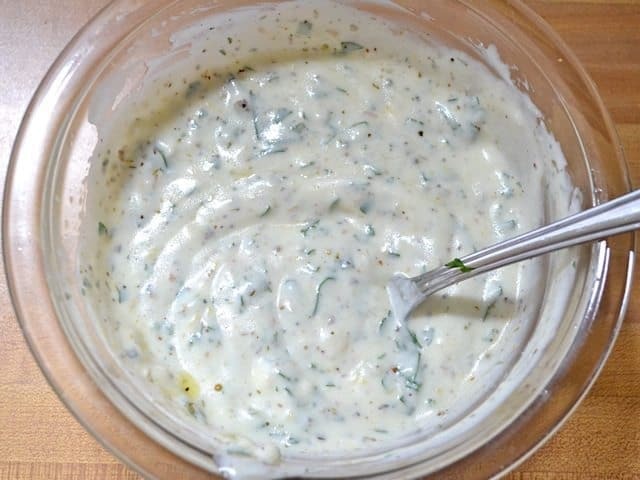 Greek yogurt has a lot less moisture, so it will definitely affect the texture of the marinade. I haven’t tested using that ingredient, so I’m not sure how that would affect the end result. I used Greek yogurt and will from now on. It was good. But the recipe calls for only half the juice of a lemon where the ingredient list says 1 medium lemon. It was pretty lemony. My husband doesn’t eat anything with bone in it. I want to make this recipe with Boneless Chicken Breast. What do you think I should do for time wise on them? For boneless breasts I’d probably cook them in a skillet instead, so you get some browning action and the quick heat will prevent them from drying out. The total time will depend on their size and thickness, but probably about 5-7 minutes on each side, over medium. Or, if you still want try baking them, you can use this method. Made this tonight using boneless skinless chicken leg meat. It turned out great. Also, I have to say the marinade (before adding the oil) is pretty amazing on it’s own. It could make a nice sauce for something. I baked it in a dish and there was enough flavorful liquid left in the pan I might try using it to cook some rice! Delicious! I tweaked this recipe a little by using boneless thighs and added some chopped mint, green onions, a little onion powder, and paprika for color to the marinade. I was worried that the thighs would dry out so I also used a little more yogurt than in the recipe. So juicy and flavorful, will definitely make again. I had never used yogurt as a marinade before, but will now try making other marinades with it, thank you!